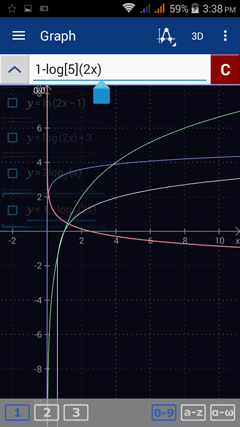 A logarithmic function is expressed in the form y = log[b](x) with base b where b > 0, b ≠ 1 and x > 0. 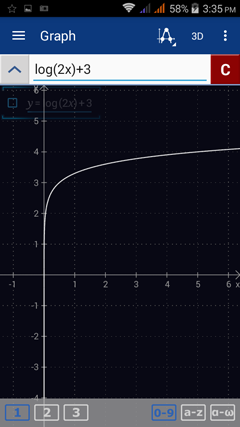 A common logarithm is written as y = log(x) and is understood to have a base of 10. 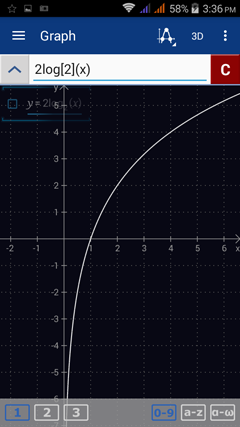 A natural logarithm is expressed as y = ln(x) which is the same as log[e](x) with base e ≈ 2.7182818. 1) If the equation is defined explicitly i.e. 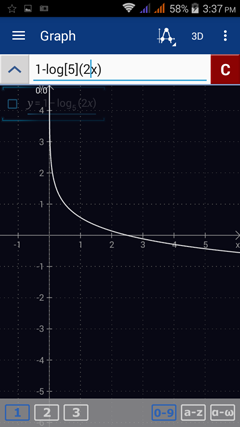 "y =," enter only the logarithmic expression using the log keys (ln, log, log2). and enclose the argument in parentheses. Use the ln key to enter a natural log. Tap the ln key twice to enter a base 10 log. Tap the ln key three times to enter a base 2 log. To enter a different base, either edit the base "2" in the base 2 log or type "log" using the a-z keyboard and enter the base in brackets [ ]. 1) Enter the expression: ln(2x - 1). Hit enter to go to a new line. 2) Enter the expression: log2x + 3. Hit enter. 3) Enter the expression: 2logx. Hit enter. 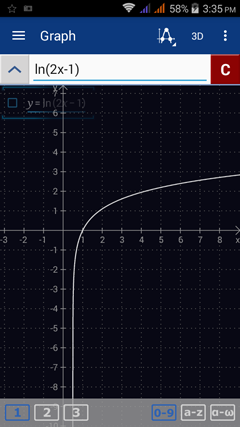 4) Enter the expression: 1 - log(2x).